Unchanged and unsolicited feedback from customers. Personal details removed where requested. Just wanted to let you know my tools turned up this afternoon and I am absolutely blown away. You do phenomenal work mate and I'm so happy I finally have some of your top quality tools. Thanks again for for getting it in the mail and getting it to me before Xmas, I really appreciate it. I look forward to recieving the remaining gear during 2019. I just wanted to drop you a short note to say - thank you! The tools arrived yesterday and the only word that I can find to describe them is exquisite. Chris, Saying that the Blackwood Sliding Bevel I received today exceeded my expectations would be an understatement. Thank you for an excellent product, and I have a sneaky suspicion I’ll be doing business with you again in the future. Hi Chris, picked up your double square from the PO this afternoon and eagerly tore off the packaging. I then proceeded to manipulate the knurled knob that holds the etched blade in place and thought this is cool. Upon arriving home, I proudly displayed my new purchase to the 5 monkeys that live at our place, foolhardishly thinking that they too would be in awe of such precision and craftsmanship. No.2 reactor remarked on his sighting of the square, “You paid how much for that?!”. I returned fire by commenting on his $45 branded hoodie from a prominent sports store, made in China by some bloke who gets paid peanuts. Hammered home my point by “betting” him that my new Aussie made square would easily outlast his cheap import and that my new addition would be making me money, not costing me money. Round 3752 to moi in the battle of life!!!! I received my Signature Series 7" square and 7" sliding bevel today and wanted to let you know how absolutely thrilled I am with these tools, thank you! The wait was worth it! You are a true gentleman and working with you was an absolute pleasure. The fit and finish on these tools is superb and I cannot seem to let them out of my hands since I opened the package. A sincere thank you for the dedication and talent which you bring to our craft and the fantastic tools that you are making for not only your current customers, but for future generations which will enjoy and marvel at these fantastic tools. Hi Chris: I attended the Handworks Event this past week in Amana and bought 2 of your sliding bevels (4" boxwood and 7" Blackwood). The workmanship is amazing! It's some of the best work I have ever seen. I will no longer have to worry about the blade moving while doing layout work. Fantastic job. Many Thanks. Will order more in future. I received the bevel gauge in the mail the day before yesterday, you did a great job of packaging for protection. It is everything I anticipated and more. The more is the shear weight, a delight actually, the balance, and the locking mechanism. While I anticipated nothing short of excellence in the tools ability to lock the blade in place, I am amazed at how easily and with as little of a turn of the knob is required to do so adequately. It will be a pleasure to spend the remainder of my life with your tool in my hand and on my bench; the wait and anticipation has been well rewarded. Thank you Chris, I hope to purchase another tool or two of yours in the future, and know with confidence that they too will exceed my lofty standards of excellence and I will treasure them the remainder of my days. The tools did come and my husband is thrilled with them!!!! He loves them very much and also loves the quality!!!!! Wife of G Halamadaris, Neurosurgeon. USA. Sorry for the delay replying - I was travelling and got back just a couple of days ago. A quick note to let you know I've received these tools. They look spectacular and I could not be more pleased. But what I was struck by was that the spectacular looks go hand in hand with very thoughtful design of function. The sliding bevel stays put when locked, something every other bevel I had used has been cursed at for. The tab on the square is nice to prevent it rotating on the wood. But the fact that the blade and stock are balanced so exquisitely as to prevent the square from rotating off the wood - these tools will become my favorite, most used, tools. Many beautiful tools are enjoyed more in being looked at than in use. Tools like yours are a vanishingly rare exception to what seems to be an increasingly common rule to things made today, which will acknowledge multiple criteria but sacrifice some at the expense of the others. Today is my anniversary, not that that is of interest to you, but from my wonderful wife I received a matched set of Black Redgum try squares. I have not had the time to use them yet of course, but I thought I would comment on the quality of the squares. Even though I expect a high degree of accuracy with your tools, having everything that you make apart from these squares, I was amazed at the accuracy of these squares. To make a 10’ square with a deviation of 0.005mm is way beyond my expectation for a wood working square. The finish and detailing on these squares is very impressive and to the highest quality. Your tools are the benchmark that I use for all that I buy, and you have now raised the bar just that bit higher. To think that I had never heard of you or seen your tools before a few years back when I watched you at the Brisbane woodworking show sell a double square to someone else. That guy took so much of your time, hopefully he ended up buying one, that I didn’t have time to wait and talk to you myself. However, I always remembered the passion that you spoke with about your tools that I had to jump online and check out the rest of your wares. Alas, now I have everything that you make, and they are sure to last not only my lifetime but that of my children’s, I have no need to buy anymore. I wait for the next addition to your line up of tools and the excuse to find a need for it. Maybe your mallet will be ready for next year!! I wanted to let you know that I recently received one of your 4" engraved bevel gauges as a gift from my friend Jameel Abraham. I would simply like to comment that it is one of the finest pieces of craftsmanship I own. It is, in fact, one of those rare tools which, upon using it the first time, absolutely innoculates one to the possibility of ever being happy with another version of the tool. I use a bevel gauge a fair bit making planes, and have owned quite a few. To be honest, I'd never really considered before how completely unsatisfactory every single example I've ever used was - I think I'd become accustomed to the notion that they were shoddy and flimsy tools by their nature, and were habitually prone to losing their settings. Every other version of this tool I have ever used is a toy compared to yours. I hope never to have to handle another. From design to execution, it is a flawless tool. My congratulations and thanks for such a spectacular example of fine work; it is a pleasure to own and use, and is the sort of device that makes one strive to be worthy of it, and to do better work. This one from Steve Quehl, woodworking enthusiest and owner of the Woodcraft Atlanta GA store who took it upon himself to become the first US distributor of my tools. 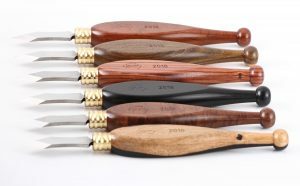 Introducing the Finest Handcrafted Woodworking Layout Tools on the Planet! I met Chris Vesper of Vesper Tools at the October ’08 Woodworking in America Conference in Berea, KY. The passion for woodworking excellence exuded by this young Australian, as well as the astounding quality of his tools, immediately impressed me. I bought his cutting gauge on the spot. I was so thrilled with it that six months later I bought a pair of his amazing sliding bevels for a chair class. The experience with those tools convinced me that I had to bring all his tools into the store and make them available to the discriminating woodworkers who shop at Woodcraft Atlanta. It took me a year, but they are finally here—at least most of them—with more coming. In the meantime, my friend Christopher Schwarz had also taken an editorial shine to them [see his blog] and also wrote about them in Fine Tool Journal. Check out the elegant variations of the gauges, bevels and try squares. Note the choice of engraved metal or inlaid exotic woods, like Australian black gum. These tools may seem expensive, but they are well worth the price once you set about to use them. Their functional beauty, accuracy and fit and finish is nonpareil. These are woodworking jewels that will add immense pleasure to the practice of the craft you love. And they will perform for generations to come or as a collectible heirloom. Come by the store soon, and ask to see the Vesper Tools. You won’t fail to be impressed. Written by Steve Quehl in January 2010 for his newsletter subscribers and pinched by me for this page. At work, but had to drop you a quick line. Have just taken delivery of your new squares. Crikey! Why don't all squares have that little tab? Mechanism like a German car door and, it just works. Put it on an edge and it just sits there. This is no gimmick. It changes the way I use a square. Delighted with them. Have some layout to do this weekend, so they'll be put to work then. "Chris Vesper is only a relative youngster but has been making tools since 1998. Having received our first consignment of tools we predict that Chris is going to have a long and distinguished career making fine hand tools. Chris Vesper Tools compare very favourably with other fine hand tool makers from around the world"
Mike Hancock - owner and manager of Classic Hand Tools. 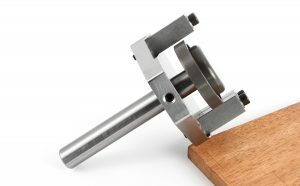 UK distributor for Vesper Tools. Thought I'd send a note of thanks to you. I have been using the sliding bevel since the Melbourne T&WWW Show and have trouble putting it down, what a great piece of workmanship. I still check the setting of the blade twice before I use it, but the main difference is I no longer have to re-check every subsequent use as I am now confident that, once set, the blade is not going to move unless given a very hefty whack. One less thing to worry about and the workmanship in the tool is itself inspirational. My other two bevels were given away last weekend to some start-up woodworkers. A very nice and precise tool. Well it arrived and it is even better then I expected!! The tab mechanism is brilliant and just sounds magnificent when you stand there clicking… I can see me doing that a lot! I cant wait to start using it. Many thanks for managing to get me one sooner then expected. I really appreciate it. I had to briefly stop at ANU today so I have already shown Greg St John at the ANU and he was really impressed as well. Email titled '7 inch bevel is great!" The 7" signature bevel I ordered at the Brisbane show arrived by mail today. Felt like Christmas had come early! It is looks great, feels solid and - this is the bit that I hadn't been expecting - makes very pleasing sounds when sliding the blade in and out. A serious bit of gear. I'm sure you're familiar with the deep satisfaction to be had from holding and using a tool that has been around for several generations I reckon that long after I'm gone, the person using this bevel will feel that same satisfaction. Nice to be around at the beginning of its journey. Did I tell you I got the bevel? It's awesome. Perfect in every way. I find myself trying to make angled parts just to use it! Stay cool! It's 5 degrees (F) here right now, and it snowed 12" overnight! Winter is here. Toasty in the shop though. Hey Chris, I'm the guy who bought a bevel towards the end of the day. Just thought I'd email you and tell you how impressed I am with the tool you sold me. In my shop I do everything as accurately as I can, and enjoy using tools that are made to high standards, I find they help me make my work better. This bevel is absolutely perfect. I have spent ages admiring it and it's the best it could possibly be: From the weight and feel of it, to how the two hex screw thingys are perfectly spaced from each edge and end of the body. Just got your package... What an amazing tool ! As I hoped for it is both beautiful and functional. The angle fixation mechanism seems to be solid as a rock, which is THE problem/frustration with most sliding bevels. What I noticed again when tools are perfectly made, is that the tactile quality is as good as the visual. Just with your eyes closed one can feel the quality. I am looking forward to 'feeling' another of your handmade tools in my hand. Last week I called you and ordered a knife and a double square. To my surprise they turned up in the mail the next day. I was just about to embark on making some drawers with dovetails all-round, and I started using them immediately. I really love both tools, and the upgrade to this higher level of tool quality has really enabled me to lift the quality of my dovetail joints. I received your knife today, and couldn't be happier. You've designed the perfect marking knife. You truly make a thing of beauty. This is the finest tool I think I have ever laid my hands on. The attention to detail, and the craftsmanship far surpass anything I have ever used. As for the double square, I just wish you made a slightly larger one. My metric/imperial conversion is far from perfect, but I carry both a 6 inch and a 4 inch. If I’m not mistaken, isn’t yours about 2 inches? Anyway, the budget’s a little maxed out, now till I teach my next class. Take care, thank you for such a wonderful tool. the try square arrived today. Superb! Real solid, heavy feel to it - fits well in the hand. Tight joints between nice shimmery blackwood inserts and metal. A work of art as always. Thanks for the craftmanship. A quick note, which I really should have written a couple of days ago. The three bevels arrived in fine fettle Friday morning (it's Monday afternoon as I write this) and two of them have already been in use. I'm enormously pleased with them. The old Stanley and the modern Japanese bevels that I have been settling for up to now have what looks to be a similar-but-not-identical locking mechanism to yours, but it has always annoyed me that I've never had any real confidence that they would or could hold their settings for a full day's work or longer. To be honest I've never really had any faith that they would lock a setting in place even for a couple of hours. So I've always wound up wasting a lot of time checking and rechecking bevel angles, out of fear that something has shifted since I last looked. A couple of days' use of your tools has already convinced me that I can rest easy now when I have to reproduce an angle today that was set yesterday or a week ago. Your tools are rock steady and I can't tell you how much I appreciate that. They're also beautiful (by the way). Thanks again for your help in getting them to me so easily and promptly. Hello Chris, It's Kevin here, I've been buying marking tools from you for the past 3 or 4 years at the Sydney show. I'm the Scottish bloke who's sent your joinery knife to Glasgow. Mate ,I just wanted you to know how pleased I am with the sliding bevels I purchased from you at the show in Sydney. They are undoubtedly the best bevels I have ever seen, now the only hard thing is I have to part with one to go oversees. I'm a lapsed cabinetmaker, but over the last few years I have gotten back into making pieces of furniture, for the love of working with beautiful Australian timbers. I am certain that using your marking tools inspired me to get going. They feel perfect in my hand When we spoke this year at the show I can't remember if I ordered a set of squares or not. If I haven't, please put me down for a set of (3) in Blood Gum if available. Also, I'd like a set of (3)sliding bevels in Blood Gum please. Let me know how you prefer to be paid for the bevels, and I'm happy to pay for the squares now if it makes things easier. Again Chris your tools are excellent, you should feel proud of the work you do. Chris, I received my small double square awhile back, and I have to say I am really impressed. This is a beautiful little tool, and obviously manufactured with love and care! It's BRILLIANT! I'm perusing your site now to figure out what I can buy next. Hi Chris, Yes, thank you! Gauge, knife and square have already seen action – superb! The square makes my Starrett look like a cheap asian copy. The gauge looks strangely familiar – and then of course realise it’s a similar shape to most panel gauges – no wonder it feels so good in the hand (speaking of which, no one makes one of these at the mo...) Though I don’t have a project on the bench that needs them right now, have also played with the bevels – fantastic action. Chuffed to bits with them. Hi Chris, I'm absolutely stoked with my parcel of tools today! The black redgum items are outstanding - I'm particularly proud and humbled to now own and use tools made from a tree that was growing in Australia before any humans had migrated to our continent. Just a small suggestion - the joiners knife (although well covered in bubblewrap) had moved in the postal process and sliced through the end of the velour case and even nicked through the outside bag. Perhaps some cardboard wrapped around the blade or even a short length of electrical conduit to cover the blade would prevent that problem reoccurring for other buyers? I'm not fussed about the velour being cut as my new knife is a user and not a poseur. Mind you, the guys in the Tech office at school tomorrow will be absolutely drooling when I show them my new marking out instruments. I'll even have some fun giving the Year 12 woodwork students a show'n'tell chat about how proud we should be that we have such talented and enterprising Australians like yourself who are producing world's best products. (That's no BS either Chris - you are an absolute gem!) Thanks again for the super fast express delivery and my early birthday presents - I've already started saving for the mid-sized bevel, you'll be hearing from me soon. Chris, I know that this is a little late, but I wanted to thank you for both the bevels you sent me a couple of months ago. They are, as we have come to expect, beautifully made and finished. Even more important, they are easy and accurate in use. I have been making a cabinet with hand cut dovetails, for which the 4" gauge is perfect, just the right size. It has been beyond me for years why bevels have adjusters exactly where I can't easily use them. Your system, though, is easy to adjust at any time. So, thank you again, and particularly for the signature series bevel to which I was upgraded. You will see that I have ordered your dovetail gauge and marking knife. I have been using your small adjustable square for about a year now and it is my constant companion in the workshop. It is so useful that I can't bear to be without it. I hope that all of your tools will see me through many happy years. Hello Chris, your tools have arrived at the customs office on 24,10 2007. Due to my absence at that time I was only able to pick them up today. The tools arrived in good order, they are well up to my expectations and a joy to behold. Thank you very much and keep up your exquisite work. Hi Chris All the stuff arrived safely, I'm very happy with the timber and it goes without saying the the Double Square is outstanding. I will be able to make some very nice razor scales from the timber and I'm looking forward to using the Black Red Gum. [Edit: this customer bought some timber scraps from me to use. Hi Chris, Just letting you know that my bevel gauge arrive safely in the mail yesterday. Great workmanship, congratulations and thanks. I'm sure this will end up in the family heirloom category. Dear Chris, I enjoyed meeting you at the show and seeing the tools you make first hand. Well done keep up the good work. As an Artist, Craftsman and Teacher myself I appreciate people who work to high standards and love to encourage my students in excellence. I get a life affirming satisfaction from my friends and associates who also work to these high standards. Hi Chris, The Joinery Knife I bought from you at the Woodworking Show is just a magic little tool. I had a scale demo to table to make to send to a client, it was an excellent marking tool and great for chamfering the edges. That was straight 'out of the box', I haven't even got around to honing it yet. Good to catch up with you again, keep well & have a great Christmas. Dear Chris, I have been delighted with the tools you have made for me over the years. You may recall that I first met you some years ago at a Working with Wood Show. At that time I saw your remarkable black river redgum marking gauge. I thought that the design and skill involved on your part in making it was marvellous. I purchased it on the spot and, now some years later it continues to delight me and is, and will remain, one of my most treasured woodworking tools. Since that time I have seen and acquired examples of each of the other tools you have made and have suggested to woodworking friends that they should do the same. 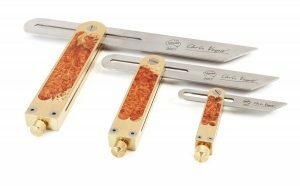 In the case of each of the tools, gauges, bevels, a square and marking knife I have been equally delighted with their design and craftsmanship exhibited by you. As I lack the necessary skills myself to make such beautiful things I must, alas, content myself by using and admiring your pieces which have such an honoured place amongst my tools. Hi Chris, Artisans strive to achieve precision and style in their finished works. To achieve this aim, the tools used need to be highly accurate, reliable, well balanced and meticulously made and in my case, a pleasure to use. I have searched extensively for such high quality tools. Without exception, the tools I have purchased from you meet all of the above standards. I look forward to many more pleasurable hours of working with your creations; they really are works of Art. Chris, This is to confirm I have received the marking gauge and Sliding Bevel and to say how pleased I am with both items. The Tasmanian Blackwood compliments the brass inlay and gives both tools a state of origin look. My reason for placing an order was to expand my Display Cabinet Tool Makers section, your tools are now on display in my office and attract the attention of visitors who appreciate craftsmanship today of a bygone practice.